The Milstein is a playable Stradivarius violin that is currently owned by Jerry Kohl of Pasadena, California, but currently lives in its own temperature-controlled vault at the Disney Concert Hall. Kohl purchased the ancient instrument for an undisclosed price in 2006 from Nathan Milstein who had kept steward of this particular Strad for forty years. Essentially, the Milstein had to audition in order to be sold to Kohl who tested eight different Stradivarius violins at LA’s Disney Hall with the help of professional violinist, Margaret Batjer. The violins came from all over the world; two from Chicago, three from London, two from Austria and one from Los Angeles. Apparently, when Margaret Batjer picked up the 1716 Milstein Strad from its case, she was overwhelmed with emotion. 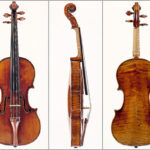 Batjer reportedly recognized the violin because of its distinctive look, with striped wood on the back and black “dimples.” She knew it was an extra-special violin as it had been played by one of the greatest violinists of the 20th century, Nathan Milstein. Not surprisingly, her reaction and the commanding sound of this Strad won everyone over, including Kohl. Thanks in large part to the strong emotional response this ancient instrument brought out from those around her, Kohl knew that the Milstein was the violin he was looking for. In the video below, see and hear the Milstein being played by Los Angeles Philharmonic Concertmaster Martin Chalifour who provides a small taste of the power and beauty of this truly one-of-a kind Stradivarius violin.